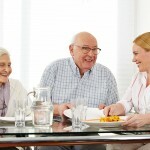 Can We Prevent Alzheimer’s Disease? Tactile Stimulation – Anything touched and anything that touches us can be stimulating. Every solid object has texture, temperature, shape. Balls in a collection can be smooth or rough, hard or soft, furry or…not. The sense of touch also includes the differentiation and recognition of temperature, pain, and body position (proprioception). You feel with every part of your body that contains nerves. When you touch something, a hot stove, for instance, the nerve endings in your hand send a message through the nerves of your hand and arm to your spinal chord, which then sends a message to your brain. It is actually the brain that “feels”; so tactile stimulation is brain stimulation! Almost anyone can give a massage; maybe not like a trained professional, but good enough to make a difference. And massage need not be whole body; a hand or foot massage can be exhilarating, a neck and upper back massage relaxing. More than that, massage is a powerful way to connect with someone who is losing other avenues to communicate. If you have ever had a professional massage, the therapist probably used a massage oil. (If you have never had a professional massage, we highly recommend it. A terrific respite for a caregiver!) The oil provides lubrication to minimize friction with the skin, but it is or can be scented. The scent is from an essential oil and adds a whole other dimension to the massage: aromatherapy. For example, lavender oil and Melissa oil (lemon balm) both have beneficial effects for people with Alzheimer’s disease, as do others. Brainpaths provides stimulation directly to the 3000 nerve receptors contained in each or our finger tips. These nerves then send impulses to stimulate the brain. Texture is not the only property that provides tactile stimulation. Temperature is also differentiated using the sense of touch. Wet or dry is a tactile dichotomy. Sticky is a tactile discrimination. 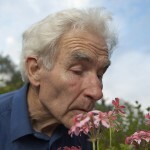 Virtual Environments – Most of us cannot take our friend with Alzheimer’s walking in the forest. Even if we can sometimes, to do it as a daily or even a weekly therapy is usually not feasible. But we can bring part of the forest to our friend. A piece of bark has the same tactile characteristics whether it’s on the tree or not. A piece of moss growing in a pot cannot be walked on, but we can still appreciate its softness. In the spring and summer leaves are green and soft and supple. Later they become more brittle and will eventually crumble in our hand. Collect leaves and pine cones and twigs and acorns. Anything you find in the forest, even if the forest is really only a city park, can be used to bring the feel of nature indoors. It is also easy to create a virtual beach or seashore. Pour an inch or two of sand in the bottom of a shallow box. On top of that put seashells and stones, dried starfish, some dried kelp or seaweed, or anything else you might find at the beach. Then allow your patient to explore with her hands. To complete the illusion, play an appropriate video or audio soundtrack in the background. So she can hear or see waves crashing, gulls being noisy…. Do you use a similar activity or have your own collection of tactile objects? We would be delighted to hear from you! Send us your thoughts and pictures, and we’ll publish them right here so others can benefit from your ideas. Balls come in a great variety of textures and sizes. Many are squeezable. Others light up or make noise when bounced, stimulating other senses, as well. Beware of balls (or anything) that light or flashes too brightly or too quickly. A collection of balls can provide a stimulating exploration. Or if you are inclined, make a collection of beanbags with different fabric coverings; e.g., satin, corduroy, fake fur, denim, etc. 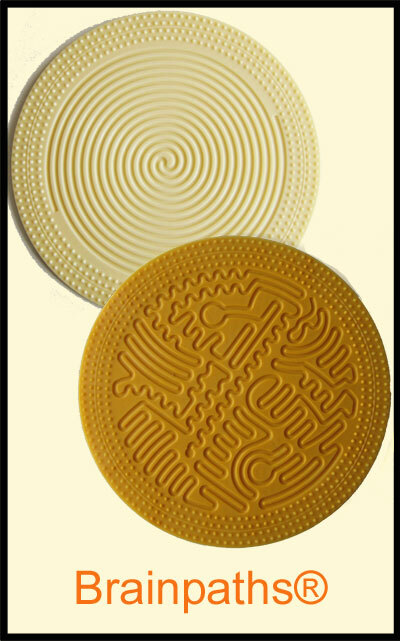 Start a collection of objects that can provide tactile stimulation. Objects for such a collection can be found almost anywhere, but know the person for whom you’re collecting. Some people in later stages of AD put things in their mouths, as children. Watch them, or keep smaller, bite-sized objects out of your collection. Using direct tactile stimulation, researchers found improvement in short-term and long-term memory in subjects diagnosed with Alzheimer’s disease. They also noticed an improvement in general mood, and in socialization and participation in daily activities. After six weeks, these improvements partially remained. Similar results were achieved by a group in The Netherlands that used peripheral tactile nerve stimulation ( fancy scientific jargon for “massage”) as tactile stimulation. Janet M. Witucki and Renee Samples Twibell found that simply massaging lotion into the hand of a person with Alzheimer’s disease significantly improved scores on a test of psychological well being. Some Products for Tactile Stimulation. 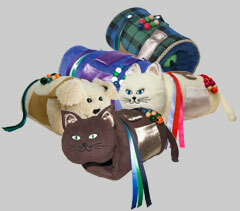 Twiddle®Muffs provide warmth and exercise for the hands to relieve symptoms of arthritis and keep fidgety hands busy. Caregivers rave about them. Bobby said, “My mom is not only suffering Dementia but she’s blind. The Twiddle Cat has become her friend; a friend that’s with her all the time, a friend that keeps her hands warm and so much more… ” The muffs inspire social interaction, are calming and on more than a few occasions have lead to a reduction in the need for medication. 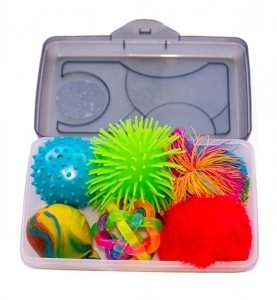 This box of six balls is loaded with sensory stimulation and fun! They are primarily tactile, but also provide visual stimulation, and exercise for the hands and arms.